With Star Trek, JJ Abrams not only revived the tired sci-fi space franchise from limbo, but also delivered a revelatory blockbuster, packed with humour, dazzling visuals and non-stop action. Sadly, however, lightning hasn’t struck twice for the multihyphenate, and Star Trek Into Darkness fails to recapture that magic, often becoming weighed down by a tired, lumbering narrative. When Captain Kirk (Chris Pine) disobey’s an order, he finds himself stripped of his honours, with Admiral Christopher Pike (Bruce Greenwood) assuming command of the USS Enterprise. 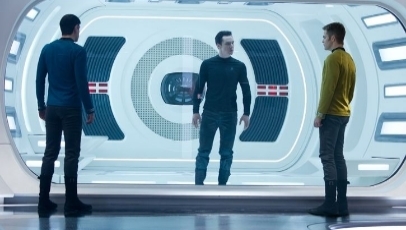 But when the enigmatic and threatening John Harrison (Benedict Cumberbatch) wages war on Star Fleet, Captain Kirk must take charge and lead the USS Enterprise and its intrepid crew on a risky manhunt. Where its predecessor felt fresh and enterprising, Star Trek Into Darkness feels unfortunately like more of the same. The script, which hails from screenwriters Roberto Orci, Alex Kurtzman and Damon Lindelof, kicks the film off well with a thrilling opening scene, but quickly weighs it down. What was a straightforward narrative soon loses control and becomes far too convoluted for its own good. Ideas are hinted at, but not all are explained, leaving a sense of dissatisfaction lingering in the air that never lifts. The characters, too, aren’t developed past their traditional personalities, which seems baffling considering a sequel should expand upon the foundations that were established the first time around. The only exception to this is Kirk, who comes into his own. Much of this is due to Pine’s performance. Among an ensemble cast as big as Star Trek Into Darkness’ is, Pine comes off best, delivering a turn that shows he has a much better grasp of the character. Zachary Quinto as Spock and Karl Urban as Bones are worth recognition, while Cumberbatch suits the vengeful villain persona. It’s Abrams’ visual style, however, that truly brings the muscle to the film. Even for those who aren’t fans of his unrelenting use of lens flare, there’s plenty to admire, not least the well executed and electrifying action sequences, the neat effects used to demonstrate warp speed and the use of Michael Giacchino’s expertly punchy, old school score. At times though, it’s all shimmer and little individuality, rendering Star Trek Into Darkness an inferior sequel.